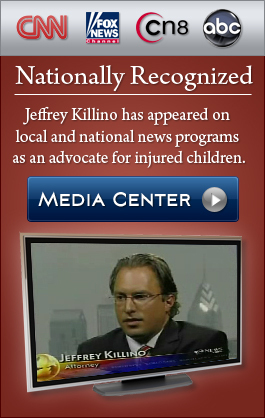 Child injury lawyer, Jeffrey Killino, understands your need for information as the concerned parent of a vulnerable child. Preventing unnecessary injury to your child – and dealing with the consequences if an accidental injury does occur – is a daunting responsibility. 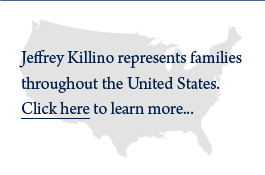 No matter where you live, or whether your case is large or small, Jeff Killino can help. The following collection of online resources is intended to help you find the information you need to protect your child’s rights and safety. Safe Kids USA – a division of Safe Kids Worldwide, an organization dedicated to preventing accidental injury to children. Children’s Safety Network – a national resource center that aims to prevent instances of childhood violence and injuries. American Academy of Child and Adolescent Psychiatry – a professional medical association dedicated to helping children suffering from mental, behavioral, or developmental disorders. KidsHealth – a site sponsored by nonprofit organization Nemours; the site offers resources tailored to parents, kids, and teens. NHTSA: Child Passenger Safety – resources provided by the National Highway Traffic Safety Administration. American Academy of Pediatrics – a medical association of pediatricians dedicated to helping parents care for their child’s health. Car-Safety.org – a nonprofit, volunteer-run website with resources on keeping kids safe on the road. Centers for Disease Control and Prevention – a government agency website that provides statistics, news, and other health information. U.S. Consumer Product Safety Commission – a government agency that oversees product safety issues and provides updates on recalled products. Brain Injury Association of America – a group that strives to improve quality of life for people (and children) suffering from the effects of brain injuries. HealthToys.org – Advocates of healthy toys and healthy children. Safe Kids – Preventing accidental injury. Know Project – Helping America’s children KNOW how to grow up strong, healthy and safe! W.A.T.C.H. – World Against Toys Causing Harm, Inc.